A completely unique position overlooking the pistes, lifts and nursery slopes with lift access down to the shops, bars and restaurants. 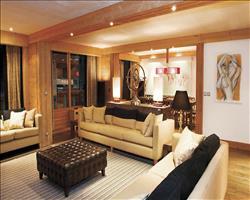 Ski hire is provided by Oxygene Ski which is in the same building as the chalets. 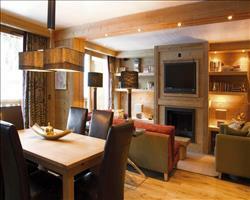 Lucerne Suite with six bedrooms is entirely independent with its own living and dining areas and dedicated chalet host. 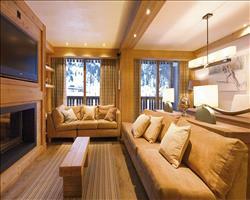 Offering a killer combination of stylish comfort and an unbeatable on-piste location. The decor is tastefully sophisticated, with a boutique-hotel vibe thanks to the luxurious soft furnishings, original works of art, solid oak floors, recessed flat screens and BOSE audio systems. This La Plagne suite with its balcony on the upper level overlooking the spectacular Grand Rochette mountain and the Front de Neige slopes. Whilst an internal lift just outside the apartment's front door takes you down to the piste level, where you will find the ski school and equipment hire. The Suite is split over two levels, with 3 en suite bedrooms on the lower level and a further 3 en suite bedrooms on the upper level along with the spacious open plan living and dining area. This apartment style chalet offers the perfect accommodation from which to explore all that La Plagne and the Paradiski area has to offer. (Lower level) - Twin with en suite bath, hand basin and WC. (Lower level) - Double with en suite bath, hand basin and WC. Space for a cot. (Upper level) - Twin with en suite bath, hand basin and WC. (Upper level) - Double with en suite bath, hand basin and WC. Space for a cot or limited space for a temporary extra bed. We update Summit View, Lucerne Suite's details often, but facilities do change. e.g. some extras listed by the supplier as "free" or included might only be for the first time you use them, or for one time per party, then charged for further use. If any specific feature is essential to your holiday, make sure you ask us to confirm the details of it before you book your holiday. This package holiday to Summit View, Lucerne Suite in La Plagne, France departs Sunday 19th April 2020, for a 7 night stay on a "catered chalet" board basis. A local tourist tax (Taxe de Sejour or Kurtaxe) is levied by many councils in European ski resorts. It varies by standard and type of accommodation and is age dependent, so not everyone is charged. It's not included in the basic price of your holiday and is usually paid locally. For reference, the average charged in winter 15/16 was between 50p and £2 per person, per night.
. 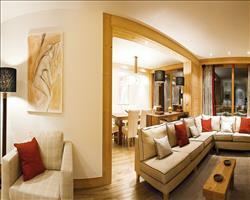 Ask for a quote when booking Summit View, Lucerne Suite. Summit View, Lema... La Plagne France, Gatwick to Geneva 19th April. Summit View, Como... La Plagne France, Gatwick to Geneva 19th April. Summit View, Gard... La Plagne France, Gatwick to Geneva 19th April. Summit View, Luga... La Plagne France, Gatwick to Geneva 19th April. "Three generation family ski trip"
We have had a lovely time. Harry and Alex have been wonderful and looked after us really well. The accommodation is ideally situated for our needs. We brought three very young children who learnt on the small nursery slope just opposite. The food has been delicious and the guys have catered for the children and our fussy eaters. Nothing has been too much trouble. Firstly both Ben and Alex were superb hosts and cooks - could not have done more to make our week brilliant. The chalet itself, while location itself was fantastic, was small and I expected more for the price. Food was consistently high quality but portions at dinner could have been bigger. Difficult to fault the boys. They looked after us very well and we were suitably impressed with the quality of the dinners and cakes. We also liked the resort but felt that we should have had a greater discount on the lift pass with so many lifts/runs being closed the first 5 days, purely to preserve the snow for the Christmas week. We are unlikely to book another pre-Christmas ski trip as a consequence. We had some problem with the water temperature and weren't able to have a bath for the first three days and had a leak in the carpet outside our bathroom. But none of the above spoilt our holiday. In summary a very good holiday. We had a fantastic week. Everything from the welcome, food, service and the chalet was top class. The boys were great, and went the extra mile without hesitation. We would definitely return. From day one the guys were really friendly and the whole holiday went really smoothly, from the airport transfer to resort and even bringing your bags to the room. Food was nice and plentiful and breakfast was more than sufficient. Free wine was lovely and the honesty policy fridge a god send for a cold beer after a hard day on the mountains. Would stay again without hesitation. One thing to note would maybe to have a nespresso machine would be a great added feature and much easier for the guests and probably the hosts as well. Great food, unlimited wine Superb location - ski in, ski out! Main lift a few meters away. Easy access to ski hire and lessons. Good après ski! Charming chalet hosts. Very sad to leave and will definitely be returning in the future!